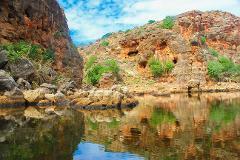 This unique outback safari is the most comprehensive day tour in the NW Cape. Experience the wonders of the Ningaloo Coast World Heritage Area, the rugged expanses of the Cape Range to the underwater wonderland of the Ningaloo Reef. Come off road and explore the ancient limestone gorges and canyons of the Cape Range, the National Parks best kept secrets. See the best of Cape Range National Park, experience beautiful Turquoise Bay and and Exclusive boat tour of Yardie Creek Gorge on this 7 hour tour with a local guide.